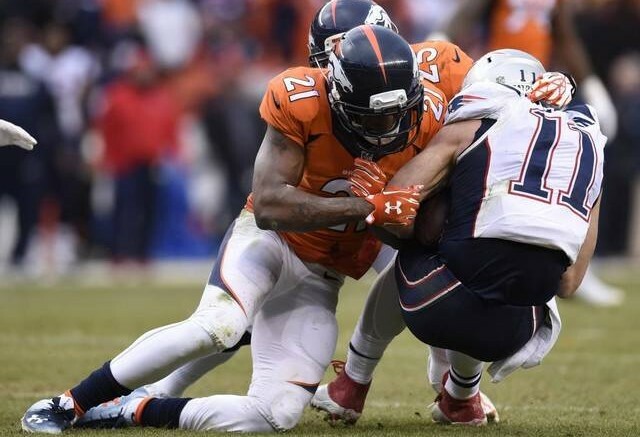 Aqib Talib (left) and the Denver Broncos brought joy to many by beating the New England Patriots, but they aren't exactly fresh faces in the Super Bowl scope either. The more I use the word “parity” in relation to sports, the more I wonder what it truly means. Does it reflect the number of different teams that win a championship? Or simply make the playoffs? Or is it just the notion of a sport having, or not having, a salary cap? There is no right answer, which of course makes it all the more fascinating. As this somewhat-predictable NFL season has worn on, I’ve started to make this analogy for baseball and football: Baseball is like watching different, hilarious comedies, but the ending tends to be similar. While acts I and II of a screenplay are different, act III can be somewhat predictable even though we all enjoy a story with a happy ending. Football, on the other hand, is like a daytime soap opera. Day in and day out (or week in and week out, as it were), the plot doesn’t vary all that much. But to keep things relatively fresh, the writers throw in plot twists and cliffhangers to try and have you guessing. Regardless of who wins Super Bowl 50, the NFL will have seen eight different teams win the big game in the last eight years, a run of variety never before seen in league history. But alas, that trend is misleading. The AFC has been represented by just three different quarterbacks for 12 of the last 13 seasons. The New England Patriots have won seven straight AFC East titles and have earned a first-round bye six straight years. The Seattle Seahawks won back-to-back NFC championships, and the Green Bay Packers have been to the playoffs seven years in a row. This season more than any other, it feels like watching reruns. New England vs. Denver, Brady vs. Manning in the AFC title game? The Pittsburgh Steelers in the postseason, and the Cincinnati Bengals and Kansas City finding a way to come up short? The Carolina Panthers and Arizona Cardinals were a breath of fresh air in the NFC, but they had to go through usual suspects Seattle and Green Bay, respectively. In baseball, it still sounds weird every time I utter the words “world champion Kansas City Royals.” The thought that, as is inevitable with top dogs, there actually could be Royals haters roaming the earth now. The once-lovable doormats are kings of the baseball world. And what’s more impressive about this last season is that they weren’t alone in a playoff field full of fresh faces. The Royals’ World Series run included postseason series wins over three franchises with a combined 41 years of absence from the playoffs prior to 2015. The Houston Astros (2005), Toronto Blue Jays (1993), and New York Mets (2006) were all October newbies. Even the American League East, once the most top-heavy division run by the Evil Empire(s), the New York Yankees and Boston Red Sox, has seen all five teams win it the past six seasons. Hope has sprung eternal is one of the most unlikely places in all of baseball. Football has experienced some welcome change at the very end of its annual charade. But as the title suggests, the end doesn’t necessarily justify the means. Be the first to comment on "The Strange Parity Juxtaposition Between MLB and NFL: The End Doesn’t Justify the Means"